Paul and I are full time artists/craftspeople living and working in our studio in 'downtown' Bethany. We came to Bethany in Jan. 1977 and have been sharing our studio and gallery for over 36 years. We design and build brass & copper fountains, garden art, decorated gourds, leather sculpture, wall art and masks, as well as belts, purses and small gift items like key rings, bookmarks and hair barrettes. We have a SECRET GARDEN beside our studio where we have 10 water features with our fountains on display. From Mother's Day to the end of September you can visit our studio and Secret Garden and see lots of frogs, fish flowers and fountains. 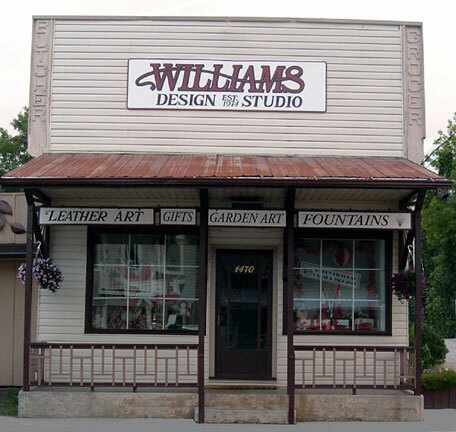 WILLIAMS DESIGN STUDIO IS A MEMBER OF THE ARTS & HERITAGE TRAIL.